The paper conservation section of the Conservation and Object Support team at Te Papa was pleased to host Liisi Hakala, from Helsinki’s Metropolia University in Finland, for a three month internship from March to June this year. 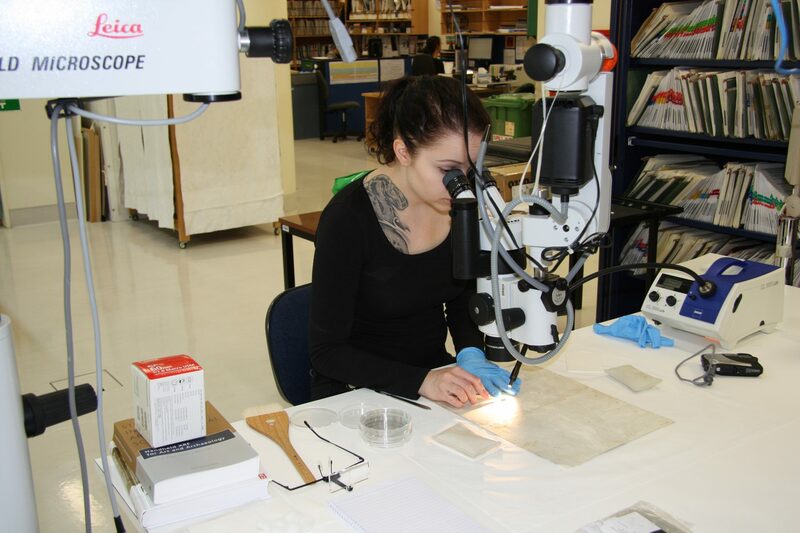 Liisi is about to enter her final year of a four-year bachelor’s degree in paper conservation. Prior to arriving in New Zealand she completed an internship at the National Gallery of Finland last year, also as part of her course requirements. While the field of art conservation relies heavily on academic training, internships form a very important part of practical work experience for every future conservator and help to establish life-long connections with others in the field. Liisi worked on several large projects while at Te Papa, including helping to treat, prepare, and condition report 44 old master prints. The prints form a part of the Bishop Monrad gift and will go on display at Te Manawa Museum. Treatment included removal of old attachments, tear repairs, stain reduction, humidification and pressing to reduce planar deformations in some of the works. Liisi Hakala treating the verso of a Monrad print. Photo by Jennifer Cauchi © Te Papa. 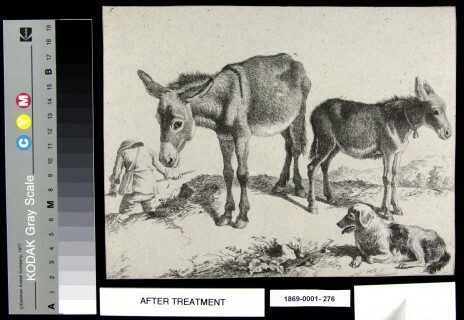 Liisi also carried out XRF (X-ray fluorescence spectroscopy) analysis on one Monrad print (1869-0001-276) to confirm the presence of hand applied colour, some of which had been identified as lead white pigment in the collection record. 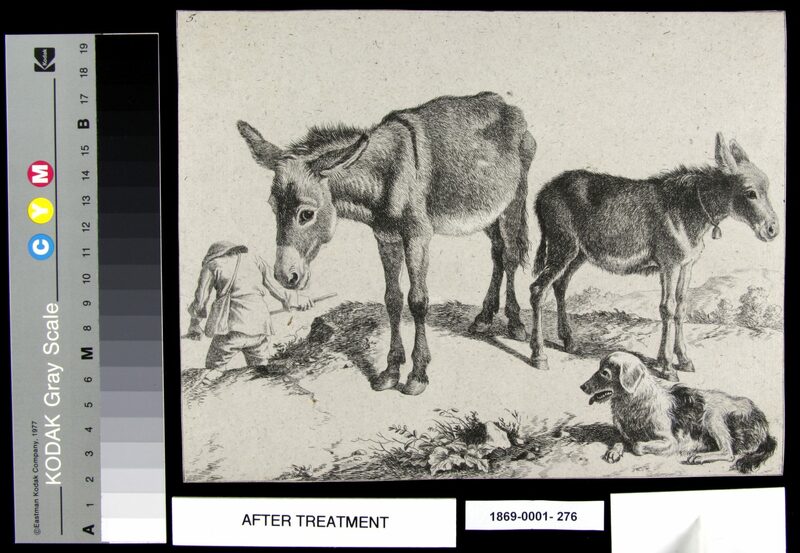 Areas with applied highlights on the print (for example the hindquarters of the dog in the foreground, see image below) now have a dark grey appearance, indicative of the reaction lead white undergoes when it is exposed to atmospheric pollutants such as hydrogen sulfide. Liisi was able to confirm the presence of lead based pigment thereby allowing a better understanding of the characteristics of this artwork and will inform possible future treatment, such as treating the darkening of the lead white. After treatment. 1869-0001-276 Untitled (Donkeys, dog and man) by Francesco Londonio, circa mid 17th century. Etching on grey laid paper with applied pigments. Photo by Liisi Hakala © Te Papa. Besides working on collection objects, Liisi also had the opportunity to carry out testing of several methods of aqueous (‘wet’) treatment on study collection materials. Having ‘test’ objects available for trialling treatment processes is a very important tool for assessing the feasibility of certain methods and seeing how various types of paper and media will react. One material relatively new to paper conservation that Liisi investigated is gellan gum, which is a food additive having film and poultice forming properties that make it a potentially useful conservation tool, particularly for stain reduction. Liisi carried out some ‘washing’ tests with sheets of gellan gum on study collection prints showing a high degree of discolouration and staining in their paper supports. Her tests showed some very promising results that can continue to be built upon. Gellan gum trial – test print being lifted to show discolouration penetrating Gellan gum layer. Photo by Jennifer Cauchi © Te Papa. Conservation internships are mutually beneficial for both the intern and the host organisation. The intern gains practical, valuable hands-on experience and makes important connections with new colleagues. Besides improvements to the condition of Te Papa’s collections, the host institution is able to contribute to the dissemination of conservation knowledge and form relationships with overseas organisations and individuals. We have really enjoyed having Liisi work with us over the past three months, and we are very grateful for all her work and contribution to the Conservation and Object Support team. We wish her well in all her future endeavours!